Use TigerChef Plastic Coat Check Tags 101-200 to put an efficient coat check system in place in your restaurant, bar, theater or catering hall. 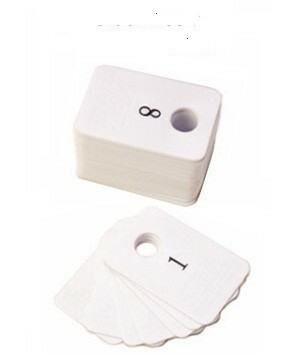 Featuring numbers 101-200, these highly durable plastic coat check tags won't tear or rip, and thanks to their large black lettering on white background, they are easily identifiable. For an effective coat check system, this set contains 2 pairs of numbers so your customer gets one number while the other number remains on the coat room hanger. Measuring at 2-1/2" x 1", they are large enough to be seen, but small enough to be stored easily by your customer.